In 2009, the daily solid waste delivered to the 3 landfills in Hong Kong amounted to 13,326 tonnes, which can be categorized as municipal solid waste (domestic waste, commercial waste and industrial waste), construction waste and special waste. The map shows the spatial distribution, by district, of sources of solid waste, disposal locations and points for recycling in 2009. 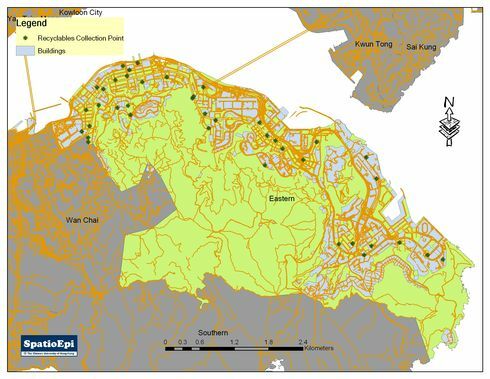 Among the 18 districts, Sai Kung gave the highest total daily solid waste generated (2099 tpd, or tones per day), which was contributed largely by construction waste. 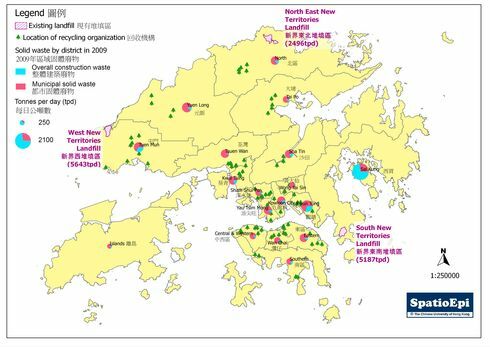 Except Sai Kung, municipal solid waste was the main component for all districts, with Kwun Tong and Tuen Mun generating more construction waste. In 2009, 51% (327 million tonnes) of the municipal solid waste was landfilled while 49% (318 million tonnes) had been recycled. One percent was recycled locally by the recycling organizations. By the year 2018, all 3 landfills will be used up, even for the one with longest operation life. Only waste reduction and recycling can lengthen the operation life of landfill. How would you choose between: disposal, recycling, or waste reduction?